Reverse compound interest is the most financially devastating force in the universe. We are speaking of credit card debt. This over $1 trillion time-bomb has Americans paying interest rates that can range from 20%-30%. This is a big reason why so many are barely keeping their heads above financial water. This unsustainable personal debt is a big factor why almost 50% of Americans lack the cash to pay a surprise $400 bill and also have a grand total of ZERO saved for retirement. In August, I wrote this about the miracle of earning compound interest. My colleague, Michael Batnick, recently published this amazing post making this point crystal clear. Michael did the math and calculated how folding a piece of paper in half fifty times would create a thickness of over 60 million miles! Unfortunately, this miracle of compounding can turn into a nightmare, when interest charges accumulate and get added on to the bill. 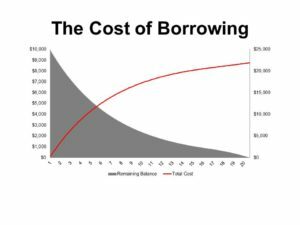 When I taught public school, I would tell my students it is a terrible idea to borrow money to buy something that would lose value the moment you took possession of it. In other words, that special deal where a flat screen T.V. could be bought for “only $20 a month” may not be that special after all. Michael created this powerful slide to prove the effect of making only the minimum payment on a credit card with a 20% interest rate. Imagine it is Spring Break. You would love to go on a week-long vacation to Cancun with your buddies. You don’t have the cash but you do have a Visa card with a $10,000 limit. You decide to go for it. At the end of the month, you realize there was a direct connection between your alcohol consumption and spending. The bill arrives and you owe $10 Gs! After vomiting, you determine you can only make the minimum payment if you want to keep up with your “Playa” lifestyle. If you just made the minimum payment, according to the credit card company’s formula, at a 20% interest rate it would take 20 years to pay this bill! In addition, you would spend more on interest payments than you did on this entire trip! In the end you would have nothing to show for this adventure, except for maybe that intestinal parasite that is still giving you problems. We are trying to warn our nation’s youth about the dangers of becoming a slave to debt. We intend to go into many schools to spread the gospel of both the extreme pleasure and pain that compound interest can bring. In my mind there are few more important lessons than this. Who would have thought the first step to becoming Master of the Universe would be to understand how to properly use a credit card? Are Expensive Universities Worth The Price?